I had the opportunity to work in China for French Company. My company has successfully put in place a mixture between French way of working and Chinese culture. One important thing for Chinese people is to keep a healthy mind and body. My company plans often some outings in Beijing neighborhoods to follow this spirit. 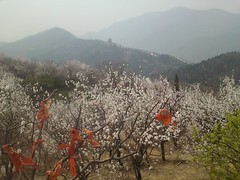 I had the chance to go two times to fragrant hills since I joined the company 6 months ago. The first time was during spring for cherry blossom and the second time was couple of days ago for the Red Leaves Festival. 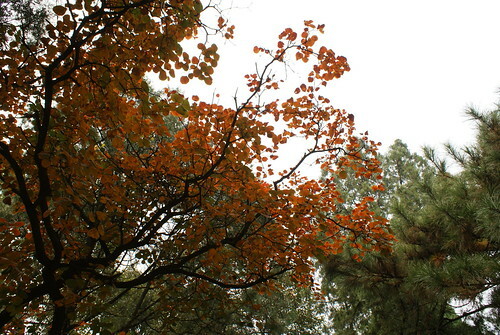 Xiangshan ( 香山公园 – Fragrant Hills Park) is located in the North West of Beijing, about 20 km from the city centre. The ticket price is 10 yuans. 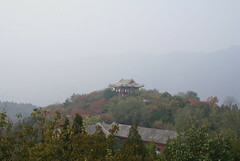 This park covers 1.6 km2 and consists of important vegetation, landscape areas and several temples on the way to the peak. The peak, Xianglu Feng, is 557m hill. 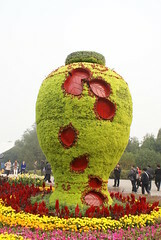 It gave its name to the Park because of two large stones which look like incense burners (Xianglu Feng in Chinese). 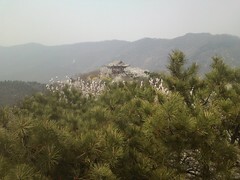 It is really popular to climb to the top by foot. 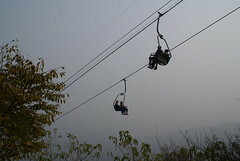 For the lazy people, the park installed a cable car (50 yuans/pers.). The view from the top is well known as visitors can enjoy magnificent sightseeing with important vegetation and Beijing city. Following my “Lonely planet” introduction, I will try to share my personal experience during my two visits to this Park. I had landed in Beijing since 3 days when I went there for the first time. I was pretty rough day as I was still in Jetlag and the weather was really hot. Even though, I successfully reached the summit to enjoy the Cherry blossoms and the incredible view…. Ha No, it was really foggy this day! During the second trip, I was in really good shape (thanks to my sport activities in Beijing) and reached the summit in the first group. I prepared myself and brought my camera to shoot this sightseeing… and then, second time, polluted weather with smog… even worse than the first time! This park is one of the places that I recommend to Beijingers or tourists who will stay couple of days in Beijing. You can enjoy the nature and important vegetation. I was unlucky with the weather during my trips but I think that it is really common in Beijing.